Biswanath Officer in Charge Samsud Duha is actively providing personal Safety and Security advice to local citizens of Biswanath. 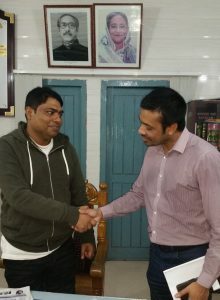 During a meeting with Biswanath 8UK Technology and IT secretary Sundar Ali (Nozrul) he stated that he is using social media and public events to promote personal safety and security by providing advice on how to stay safe and protect individual’s properties and belongings. Samsud Duha is a newly appointed OC in Biswanath and he is taking policing to a new level by actively targeting criminals in hotspot areas and preventing many crimes from taking place in the Upazilla. Interviewing a local resident MD Mamun Ahmed from Chwodhory Gaon, Biswanath, who said the new OC has changed the way policing is conducted in Biswanath and he is easily approachable and listens to concerns from residents. Other people from Biswanath have all provided positive feedback and hope the OC continues in this manner to eliminate local crimes in Biswanath. All Biswanath on test motor bikes must complete registration by by 01/01/2018. Any motor bikes without registration after this date will be stopped and held by police. This report produced by Sundar Ali (Nozrul), Biswanath 8UK, Technology and IT Secretary. Photo provided by MD Mamun Ahmed.